James Beattie is 14/1 to become the next Posh manager. Former Accrington Stanley boss James Beattie was linked to the Posh job in the Daily Mail today (April 26). That was enough for Sky Bet to introduce the 38-year-old former Everton, Southampton and England international striker into their betting at 14/1 fourth favourite. Steve Evans is 7/4 favourite to become the next Posh manager. Beattie failed to bring success to an Accrington side believed to have one of the smallest budgets in League Two. They finished 15th in his only full season at the helm. Beattie has since been coaching at Swansea, but is understood to be keen on a return to management. Beattie would not appear to boast the credentials wanted by Posh chairman Darragh MacAnthony. He wants a man with a proven track record of winning promotion from League One. One such man Steve Evans, who owns a house in Wansford, has been backed in to 7/4 favourite from 10/1 to become the next Posh boss with Sky Bet, but he is currently fighting for a contract extension at Championship club Leeds United. Steve Cotterill is leading the PT poll as readers name their preferred choice to be the next Posh manager. Evans has done okay at Elland Road, leading the club into the top half of the table and he would probably see Posh as a backward step after managing one of the biggest English clubs outside the Premeier Division. 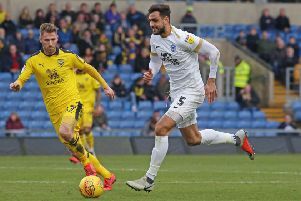 Evans admits he is a big Posh fan and enjoys a close relationship with MacAnthony and Posh director of football Barry Fry. He was linked with the Posh job last summer, but opted to stay at Rotherham United, the team he took to promotion from League One in 2013/14. Cotterill is 5/1 third favourite in the Sky Bet list, behind Evans and current Posh caretaker-manager Grant McCann. Former Posh bosses Darren Ferguson and Dave Robertson are both included in Sky Bet’s list at 20/1. Ferguson has drifted in the betting since Sunday (April 24) and both he and MacAnthony have insisted recently there would be no third spell in charge at the ABAX Stadium for a man who steered the club to three promotions in his two previous stints in charge. Robertson has no chance. He was sacked after just six League One matches as manager at the start this season. He is now at Irish League side Sligo Rovers who won for the first time this season last weekend, at the ninth attempt. Sky Bet odds (11.30am, April 26) to be Posh manager on the first day of next season. It won’t take much money to make the market fluctuate!